Three owner car. Based on the records, the original owner only kept the car for a short period. My wife and I purchased the car from the second owner in June 1988. The car had ~31,000 miles when we bought it. The car has not been smoked in since we have owned it, and there is no evidence that it had been smoked in by the previous owners. The car has spent its life in Austin, Texas and is rust free. The engine runs very strong. The timing belt and water pump were replaced as maintenance items at 45K miles, so both are current. The engine has never been rebuilt, does not burn oil, and does not leak oil. The heads have never been off the engine and have never been rebuilt. The engine has never been overheated, and head gaskets are original. The engine was tuned with new spark plugs, cap, rotor, coil, and spark plug wires within the past 3K miles. Oil changes have been on 5-6K intervals using synthetic oil. The side tanks on the radiator were replaced within the last 10K miles and the car runs cool at midway between the 2nd and 3rd marks on the temperature gauge. Oil pressure is steady at 5 bar while driving, and 3.5-4 bar while idling. The engine idles smoothly. 5-speed manual without limited slip. 2.73 final gear ratio. Gear oil is Redline NS70W-90. Oil was changed within the last 10K miles. The transaxle drips a small amount of oil from a seal near the front. My mechanic has noted that the amount is small enough over time that it does not warrant pulling out the transmission to fix. The transmission shifts smoothly between 2-3-4-5 with occasional notchiness between 1-2 that is typical with the ZF manufactured synchros and gearsets. Porsche switched to Borg-Warner internals in 1985 to eliminate this typical symptom. The car uses the original shift lever which has not been shortened. The clutch was replaced with OE parts at 36K miles and is not showing any signs of slipping. The car has the original paint which is in extremely nice condition. There are typical small chips to be expected on a car of this age, but the chips have been maintained with touchup paint. The major fault with the paint is a 3ft long key scratch on the driver side front fender. This supposedly happened two weeks before we bought the car. I used touchup paint to repair the scratch, but it is still noticeable. I have never considered having the fender repainted because the rest of the paint on the fender is in such nice condition that I've always felt respraying it would actually raise questions as to whether the car had been involved in an accident. The way it is now, it is obvious that there is only a scratch and not any other body work. The car was scraped by a truck with a brush guard in the rear which left scratches on the rear flexible bumper. I have repaired these with touchup paint, but for the same reason as the front fender, they did not warrant repainting the entire bumper because the rest of the paint was in such nice condition. 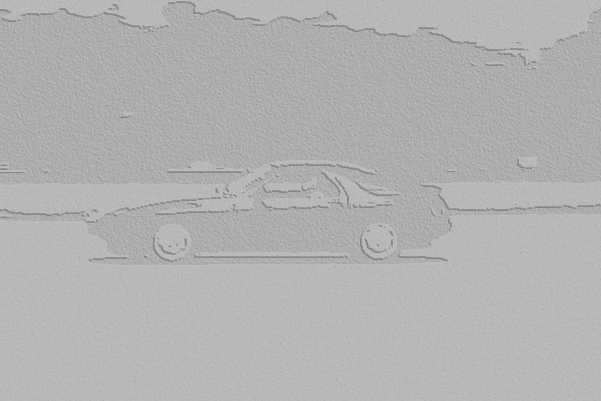 The car does not have body side molding (a.k.a. rub strips). The car has all of the original leather. The full leather interior option adds leather to the dashboard, center front and rear consoles, sunroof headliner, door panels, and rear side panels. 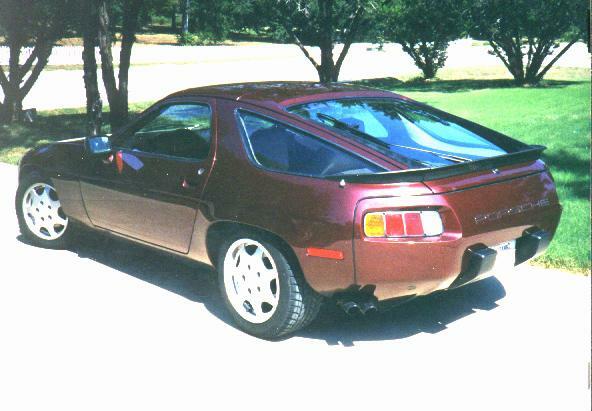 As is typical with 928s having full leather, the leather on the dash has pulled away from the defroster vents. This delamination is fairly minor on the driver side, but quite noticeable on the passenger side. The passenger and both rear seats are in very good to excellent condition. The drivers side seat is free of rips and tears, but does show wear on the outermost side bolster and surface cracks in the finish on both bolsters. The rear panels are not warped at all. The dash pod does not have any cracks. The leather on the dash, console, door panels, and headliner is dark brown. 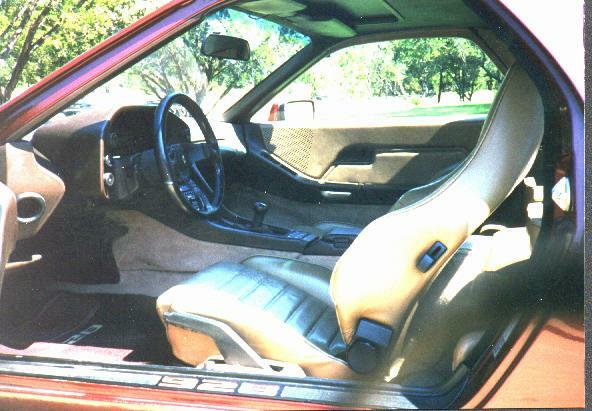 The seats, rear panels, carpet, and door inserts are tan. The exhaust system is stock and original with the exception of a catalytic converter test pipe. I still have the original catalytic converter and will provide that with the car. The car is currently equipped with a black, thick-rim, Personal Fittipaldi-design steering wheel. I still have the original brown leather factory wheel in average to good condition. The car has the original manhole-cover wheels shod with Yokohama AVSi tires front and rear. Wheels are 7x16 all around and tires are 225/50-16 in front and 245/50-16 rear. Front tires are almost new; rear tires still have tread above the wear bars, though not as much tread as the fronts. The brakes work fine and have a lot of pad left on fronts and rears. Brake lines to the calipers are braided stainless steel. 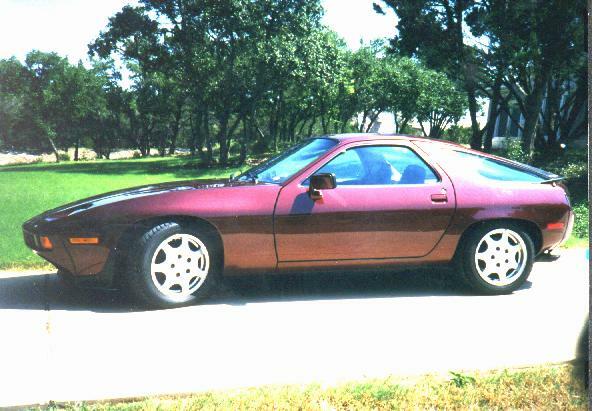 The car was aligned by a mechanic that understands the idiosyncrasies of aligning a 928, and all tires wear evenly. Original steering rack. No leaks. Original standard suspension (i.e. not the sport suspension option) with Boge black shocks. The a/c blows extremely cold. The car had had all original freon and parts up until 2001 when the expansion valve went bad. The expansion valve, freon, and drier have been replaced. Operational and has never leaked. For all intents and purposes, it is non-functional. In reality, it is locked in on one station regardless of which station it is tuned to but there is a lot of static. The radio actually worked fine up until 6months ago and then performance started to degrade. The speakers worked fine when the radio worked, so I do not suspect that they have any problems. The antenna is retractable and working. Factory tinted - no aftermarket tint. Side windows go up and down as designed.